Since 2004 South Africa has had in place legislation that regulates the responsibilities of business to the transformation of society, and this regulation includes an element that relates to corporate philanthropy. To date, however, very little has been documented about the influence of this legislation on corporate philanthropy. 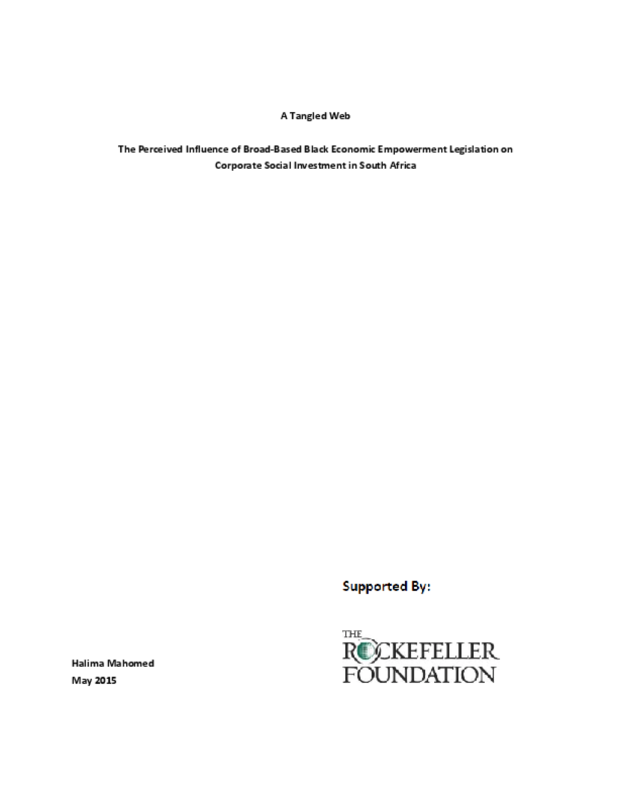 A new research report by Halima Mahomed, A Tangled Web: The Perceived Influence of Broad-Based Black Economic Empowerment Legislation on Corporate Social Investment in South Africa, aims to partially fill this gap. The research explores the perceived influence of the legislation on issues such as the extent, flexibility and approaches to giving; highlights the limitations that arise from the structure and framework of the legislation; and interrogates some of its unintended consequences. As discussions on the feasibility of regulatory mechanisms gain traction in other places, it is hoped that this research will help to raise key issues for consideration and exploration.